AUSTRALIA – The Queensland government is poised to declare Adani’s proposed Carmichael coal project “critical infrastructure”, a rare step that will elevate its status to an operation that is “essential to [the] state’s economic and community wellbeing”. The Palazsczuk government appears to be bolstering its visible signs of support for the controversial and stalling coal export project. The state mines minister, Anthony Lynham, is reportedly due to accord it the highest priority development status on Monday. Slowing down construction of coal-fired power stations will be vital to hit globally agreed climate change goals, the World Bank president, Jim Yong Kim, said as he outlined a five-point plan to flesh out last year’s Paris agreement to reduce CO2 emissions. Speaking at a climate ministerial meeting in Washington during the bank’s annual meeting, he said there was no prospect of keeping global warming at or below 2C (3.6F) if current plans for coal-fired stations, especially those earmarked for Asia, were built. Back in 2004, four major hurricanes hit Florida not long before the presidential election. Charley, Frances, Ivan and Jeanne caused billions of dollars in damage, and they also, as I wrote in my 2007 book about hurricanes and climate change, “Storm World,” “touched off the biggest meteorological argument of the decade.”… Yet even as scientists debated, politics and popular culture didn’t wait for their answer. Hurricanes quickly became a symbol of a warming world. This was, of course, problematic — the science linking hurricanes and climate change was contested. There was little doubt that a changing climate would change hurricanes, given that they are fundamentally fueled by ocean heat — but precisely how that would play out and whether the changes had already begun was hard to say. On Friday, Australia’s federal and state energy ministers met for an extraordinary meeting following the complete loss of power in South Australia on September 28. The COAG Energy Council announced a wide-ranging independent review to provide advice to governments on a coordinated, national reform blueprint. The review will be chaired by Australia’s Chief Scientist, Dr Alan Finkel. How can we provide a high degree of energy security in Australia at the lowest possible cost, while contributing our fair share to the global effort to contain the costs of climate change? … Six sets of changes have been especially important for Australian choices in the electricity sector. Four of these relate to changes in the cost of renewable energy and storage relative to coal‐ and gas‐ based electricity. Two relate to perceptions of the costs of climate change and the necessity of mitigating them. The first deal limiting greenhouse gases from international aviation has been sealed after years of wrangling. From 2020, any increase in airline CO2 emissions will be offset by activities like tree planting, which soak up CO2. The deal comes in a momentous week for climate policy when the Paris agreement to stabilise climate change passed a key threshold for becoming law… Attempts have been made for nearly two decades to include aviation and shipping in the UN’s climate agreements, but both sectors have managed to avoid firm targets. Human memory does not operate like a video tape that can be rewound and rewatched, with every viewing revealing the same events in the same order. In fact, memories are reconstructed every time we recall them. Aspects of the memory can be altered, added or deleted altogether with each new recollection. This can lead to the phenomenon of false memory, where people have clear memories of an event that they never experienced. False memory is surprisingly common, but a number of factors can increase its frequency. Recent research in my lab shows that being very interested in a topic can make you twice as likely to experience a false memory about that topic. In September last year, Astra Agro Lestari earned plaudits for issuing a zero-deforestation pledge. A new Aidenvironment report tracks the company’s progress implementing its commitment. A major issue is Astra’s policy for preventing fires on its land. Fires raged across its concessions last year, but the firm has not elaborated how it plans to stop burning. Mongabay has obtained a new, high-resolution satellite image of Petroamazona’s suspected pipeline and drilling platforms in the famed Ishpingo-Tambococha-Tiputini (ITT) block. Obtained from Planet, the image was analyzed by the team at the Monitoring of the Andean Amazon Project (MAAP) just after Ecuador announced it had begun drilling in arguably the most biodiverse place on the planet. With a resolution of three meters, the image shows a snaking pipeline amid the unbreakable green of the rainforest that ends in rectangles, which are believed to be oil platforms. The picture is especially important given a blackout on outside monitoring of the ITT drilling. What’s the best way to save the whales? Nearly 90 years have passed since North Atlantic right whales became a protected species following their devastation by whalers, but their populations have yet to recover. A new report by the National Academies of Sciences, Engineering, and Medicine lays out some of the reasons why. Although scientists know a combination of overfishing, pollution, climate change and human-created ocean noise is harming the whales, they have no idea which culprit is worse, and because of that, they’re not sure which one to prioritize as a target for expensive protection efforts. AUSTRALIA – The sight of eggs in experimental nesting boxes has brought joy to researchers who say it marks a turning point in the fight to save the rare migratory swift parrot from extinction… Last winter, scientists and volunteers put 300 nesting boxes in trees on Bruny Island, which acts as a safe haven for the parrots because, unlike in rest of Tasmania, they are not preyed upon by sugar gliders. When catastrophe strikes, who foots the bill? For a category 4 storm in this area – as it was deemed at one point – the economic disruption is expected to cost anywhere from $5 billion to $15 billion, according to Bloomberg. The storm was later downgraded to category 3. Real estate analytics firm CoreLogic estimates that more than 954,000 homes in Florida are at risk of surge damage from a Category 4 storm, with another million at risk in South Carolina, North Carolina and Georgia. So who’s going to pay for it? Rather than striving to create sustainable companies, I believe that we need to start thinking about regenerative companies. Like nature, how can we better company models to achieve more abundance, supporting themselves and the many others within their business ecosystem through products, manufacturing, capital, employees and our communities? Instead of a net zero, how can we rework the equation so that our businesses are constantly netting positive success and value? Companies have begun to recognize that climate change is occurring and that it poses a significant risk to their business. However, new research suggests that they may not be adequately addressing the problem. New research from consultancy Article 13 found that companies are not reporting how planetary boundaries and social thresholds inform their environmental and social targets. How can pay-as-you-go solar be financed? Pay-as-you-go solar companies are the start-up community’s proposed answer to the challenge of 1.2bn people living outside the reach of the electricity grid. To scale, they need debt capital. Lots of it. Some operators are creating structured finance products to cut costs and address more potential investors. UK – The bright yellow Big Lemon buses are a familiar sight – and smell – on the roads of Brighton and Hove. For nine years the Community Interest Company has run all its vehicles on waste cooking oil from local restaurants, recycled into biodiesel, but now it wants to go one step further. The Big Lemon wants to install solar panels on the roof of its east Brighton depot, storing the energy in batteries and charging buses overnight. It is working with the Brighton Energy Cooperative (BEC) towards a vision of zero emissions bus services in every UK community by 2030, using Brighton as a pilot. SPI: The Plastics Industry Trade Association has announced a new project that will test the belief that increased automotive recycling is beneficial to recyclers and the plastics industry. The aim of the “Automotive End-of-Life Vehicles (ELV) Recycling Demonstration Project” is to develop a method of collection and recovery of polypropylene (PP) and thermoplastic olefin (TPO) auto parts in a way that demonstrates technical and economic feasibility. One evening, about 10 years ago, I turned down the volume on my compact disc player and used the phone attached to a wall to call my girlfriend. Later, she got a taxi back to our home and we watched a movie hired from the local video store. As the film played, the amount of carbon dioxide in the atmosphere hovered just above 380 parts per million. It is a very different experience today, with Uber, music and films all available on the same smart phone as the tweets that tell me that we’ve swept past 400 parts of carbon dioxide per million, and on which I text my wife using a stream of emoji and pictures. Radical as they are, these changes are more than just shifts in the banal details of daily life. Many observers think climate change deserves more attention. They might be surprised to learn that U.S. military leaders and defense planners agree. The armed forces have been studying climate change for years from a perspective that rarely is mentioned in the news: as a national security threat. And they agree that it poses serious risks. UK – Hundreds of people are expected to protest near a fracking site in Lancashire that was given the green light by the government this week. The Lancashire Responds rally on Saturday is the first shot across the bows of Cuadrilla, in what anti-fracking groups and local residents say will be a sustained campaign of action to stop the company fracking next year. Can a green building make your company smarter? That’s what new research suggests, underscoring the ROI for green certifications — not just for optimizing the usual factors such as energy and water use, but for elevating workforce productivity… The early results of a new study dubbed COGFX are being buzzed about for finding 26 percent higher scores on cognitive tests for workers in LEED-certified buildings. USA – As Hurricane Matthew pushes floodwaters into seaside towns from Florida to the Carolinas, climate scientist Andrea Dutton wonders if the most powerful hurricane to hit the United States in a decade will serve as a wake-up call to the perils of rising seas. The vulnerable coast needs to pay attention, says Dutton, who teaches geology at the University of Florida in Gainesville. “Matthew can help to change the conversation, in the way that Katrina did in New Orleans,” she says. 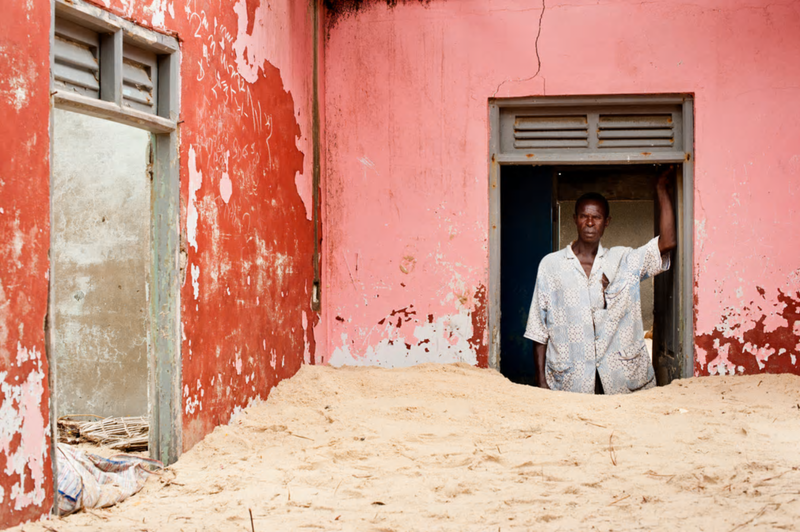 Worsening coastal and riverine erosion is sweeping away homes and livelihoods on the Ghana coast. Photographer Nyani Quarmyne visited the small fishing village of Totope, which was once three miles from the sea but has now virtually disappeared. Levels of beneficial omega-3 oils in farmed salmon have fallen significantly in the past five years, a study shows. BBC News has learned that, on average, levels of omega-3s halved in the fish over that period. Despite this, the analysis shows that farmed salmon is still one of the richest sources of these fatty acids. But the industry is exploring new ways to arrest the decline – which appears to be due to the type of feed given to the farmed fish.